With the TQ 2.4GHz radio system, you just switch on and drive. There are no channels or frequencies to manage, so the focus is on having fun. The TQ’s ergonomic design is comfortable for all-day driving, and its sleek lines are enhanced by an internal antenna that is impervious to damage. To customize the controls, the transmitter’s factory servo directions can be easily adjusted using the TQ’s simple programming system. Slayer Pro 4X4’s longer wheelbase is matched with new, wider suspension arms to increase its track by 26mm. The result is a 10% increase in the Slayer Pro 4X4’s “footprint,” and greatly enhanced stability in rough conditions and radically improved cornering. Go in hot and pitch it sideways—Slayer Pro 4X4 rages through corners with roost pouring off all four tires, just like the real deal. High performance off-road racing demands the most from shock absorbers, so Slayer Pro 4X4 is equipped with the best shocks in the business, our hard-anodized, PTFE-coated GTR dampers. Threaded bodies and oversized spring collars make it easy to set preload, and long-wearing, low-friction titanium-nitride shafts provide slick shock action for superior suspension response and reliability. No other engine combines power, reliability and convenience as well as the TRX 3.3 Racing Engine. This high-performance powerplant features a precision composite slide carburetor for easy tuning and crisp throttle response, PowerTune™ blue-anodized cooling head, dyno-proven IPS crankshaft and multi-port rear exhaust. The TRX 3.3 engine is also equipped with Traxxas’ exclusive EZ-Start® electric starting system that makes bringing the Slayer as easy as pushing a button. With EZ-Start, there’s no need for starter cords, glow starters or their hassles. Instead, all you have to do is insert the EZ-Start into the starter port and push the start button. It only takes one hand! The Traxxas EZ-Start lights the glow plug and starts the engine in seconds, and exclusive Smart Start™ technology monitors critical starting functions, automatically sensing and diagnosing potential problems for troublefree engine starting every time. LEDs provide realtime status, even alerting you when a glow plug has failed. Nitro engines rely on properly shaped exhaust pipes for maximum power and efficiency. The Slayer Pro 4X4’s Resonator™ pipe was shaped with data collected from hours of dyno testing. The dual-chamber design is precisely tuned for low-rpm torque to get the Slayer off the line quickly, and a big horsepower hit on the top end for screaming speed. A mirror-polish finish looks extra stylish, but it’s more than beautiful—it’s also easier to keep clean. The Slayer Pro 4X4’s high-output TRX 3.3 engine breathes clean air through a new, larger air filter. The dual-stage design traps large particles in the outer element, while the inner element flows clean air to the engine. The new, larger diameter foam elements allow greater airflow, and more air means more horsepower. More fuel means more drive time between refills, and with 150cc on board, Slayer Pro 4X4 stretches every run. A pull handle makes it easy to yank the tank open for fast filling, and the tank is specially designed to maintain consistent fuel flow no matter how rough the driving conditions. The tank’s lowered sump keeps the fuel pickup submerged, and baffles prevent fuel from sloshing out of the sump. The compact radio box accepts 4 AA alkaline batteries or a 5-cell flat rechargeable receiver pack (sold separately). The on/off switch is built in, and a blue-anodized crimp nut holds the antenna tube tightly so rollovers won’t yank it out. Ready to race your Slayer Pro 4X4? A transponder mount is integrated right into the receiver box. Slayer Pro 4X4 steers with precision and authority thanks to its digital high-torque servo. With 125 oz.-in. of torque, the 2075 servo has up to three times the power of many other RTR vehicles’ servos, with the precision centering and fine control only a digital servo can offer. And it’s fast, too; transit time is just 0.16 second, giving the Slayer instant response to your commands. The 2056 throttle/brake servo applies the binders with 80 oz.-in. of muscle for positive modulation and powerful stopping, and both servos sealed to prevent contamination from dirt, dust, and even water. It takes more than a powerful engine to give a truck eyeball-flattening acceleration and high top speed; gearing is critical. Slayer Pro 4X4 features custom transmission ratios specifically tailored to suit the short-course racing style wheels and tires, and a quick-shifting two-speed transmission for a fast blast off the line and all the full-throttle speed you can handle. The transmission’s shift point is fully adjustable so you can set it to engage second gear as early or late as you like. Dirt-spraying, wheel-spinning launches are a blast, but when you want more controlled power delivery, a slipper clutch is the feature you need. Instead of spinning the tires, the slipper clutch literally slips to absorb excess power until there’s enough traction to put it down on the ground. The Slayer Pro 4X4’s Torque-Control slipper clutch uses special semi-metallic friction material and finned aluminum alloy pressure plates to dissipate heat and provide consistent traction control. Gearing can be changed without altering the slipper adjustment, and a center ball bearing maintains precise, long-lasting alignment with near friction-free running and virtually zero maintenance. With more than 45mph on tap, Slayer Pro 4X4 demands the best brakes. Traxxas delivers with a big 42mm steel rotor and semi-metallic brake pads that provide four-wheel braking with fine control, whether you need to scrub just a little speed to sneak under another racer in a corner, or a big grab of whoa-power at the end of a parking lot speed run. Slayer’s high-tech differentials are designed to handle the intense power of the TRX 3.3 engine with adjustable limited-slip action. 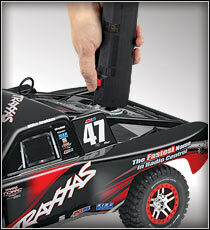 The differentials are precision sealed with Traxxas X-ring seals to hold silicone fluid inside. The silicone lube constantly flows back into the gear teeth to provide resistance to power-robbing “unloading” that often affects grease-lubed differentials. By changing the viscosity of the fluid, the amount of limited-slip action can be changed. In short, Slayer’s silicone-filled diffs give you better traction, handling and control. It takes a strong drivetrain to channel TRX 3.3 power to the wheels. Slayer Pro 4X4’s oversized, true-curvilinear telescoping driveshafts permit universal joints to be fitted on both ends of the driveshafts. Universal joints operate with greater efficiency and less wear than conventional dogbone designs, and also permit greater suspension travel without compromising power delivery. Smooth-turning and virtually maintenance free, Slayer’s Super Duty driveshafts are a perfect match for its high power and off-road mission. A Traxxas hallmark since the debut of the Revo, Slayer Pro 4X4’s exclusive rubber-sealed pivot-ball suspension is impervious to contamination from dirt and debris and more easily adjustable than conventional designs. Flexible rubber bellows seal the suspension pivots without hindering operation, and rubber-sealed bearings minimize friction while warding off contamination. Conventional stand-up shocks can’t provide the multi-rate performance of Slayer Pro 4X4’s rocker-actuated shocks. Unlike standard designs that offer the same amount of spring rate no matter where the suspension is in its travel range, Slayer’s Revo-derived design steadily increases spring rate and damping force as the suspension is compressed, keeping you in control. In addition to these benefits, the shocks are rigidly mounted to the chassis, protected from dirt, rocks, and crash damage. Slayer Pro 4X4 rolls out of the box ready for action with a factory-finished and mounted Race Replica body and decals already applied for you, so its Ready-to-Race®. There are four officially-licensed styles to choose from: Mike Jenkins edition (#47 Traxxas), Mark Jenkins Edition (#25 Traxxas), Greg Adler Edition (4 Wheel Parts), and Scott Douglas Edition (AMSOIL®). More than mere styling pieces, Slayer’s tube-style front and rear bumpers provide crash protection while adding to the truck’s realistic looks. The bumpers are designed to flex and spring back from impacts to protect the chassis and body. The chassis nerf bars let trucks rub together without tangling wheels and causing a crash. Slayer Pro 4X4 is built for extreme offroad use, so only the best rubber-sealed bearings will do. 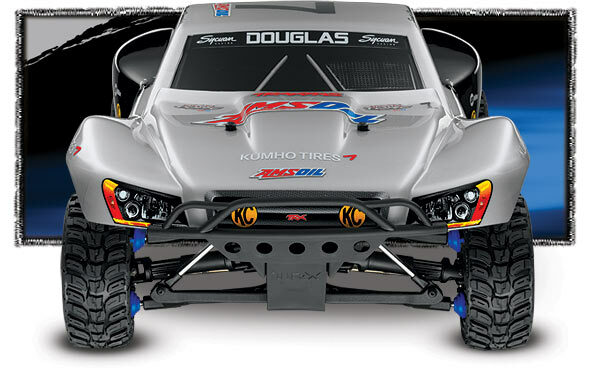 Traxxas’ precision ball-bearings resist dirt and dust to deliver lasting low-friction performance, run after run. Professional-grade hex hardware is used throughout for maximum durability and convenient maintenance. A black-oxide coating resists corrosion and gives Slayer Pro 4X4 an all-business look.